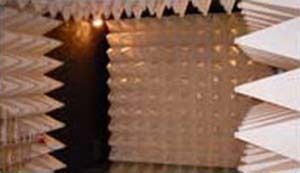 Fully Anechoic and Semi Anechoic Chambers require implementation of absorbers. Reliant EMC brings to you the Frankonia line of absorbers. You can choose from ferrite absorbers, pyramid absorbers, non-combustible absorbers or hybrid absorbers. Frankosorb® Nano-thinfilm Technology is the only non-combustible abosorber in nano-thinfilm technology with carbon offering perfect and long-time stable conditions. 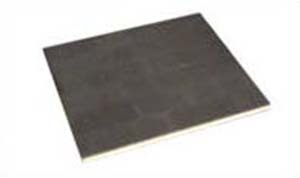 Frankonia Ferrite absorbers they offer very good reflection attenuation characteristics covering 30 MHz-1000 MHz, making this absorber suitable for the use in compact chambers. Ferrite absorbers are used where pyramid absorbers cannot be used due to limited space. Higher frequency range, up to 18 GHz, can be achieved by using a combination of absorbers. Frankonia Pyramid absorbers are available in different sizes. The required length of the pyramid absorber depends on the frequency specified for the anechoic chamber. 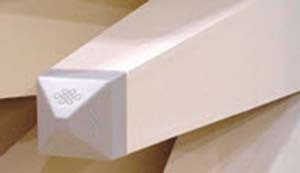 Pyramid absorbers offer lower, lower weight and use up to the high GHz range. Frankonia Hybrid Absorber technology combines ferrite absorbers with impedance matched pyramid absorbers installed in front of them. The hybrid absorbers are good solution for 3m chambers and required frequency from 30 MHz up to approx. 20 GHz. For the selection of the absorber material several things must be considered; the frequency range that have to be covered (including the requirements regarding chamber performance), the size of the place of installation as well as the respective costs. You can choose ferrite, pyramid or hybrid absorbers. An important advantage of ferrite absorbers is the fact that, despite their small thickness, they offer very good reflection attenuation characteristics starting already from a frequency of 30 MHz, thus being perfectly suitable for the use in smaller rooms. The biggest disadvantage however, is the relatively high price as well as the limitation of frequencies up to 1 GHz. Ferrite absorbers should be considered in all the cases where pyramid absorbers cannot be used due to limited space. An extension of the frequency range up to 18 GHz can be achieved by using a combination of ferrite absorbers with short pyramid absorbers (see hybrid absorbers). Pyramid absorbers are available in sizes (lengths) of 100 mm to 2.500 mm. The required length depends mainly on the wavelength of the lowest usable frequency specified for the anechoic chamber. The length decreases with increasing frequency. Pyramid absorbers of a size of >2.000 mm are mainly used in chambers with measuring distances of up to 10.0 m where the requirement for NSA correlation of better than ±4 dB has to be fulfilled from 30 MHz to 1 GHz. In tests with frequencies starting at 80 MHz (e.g. in immunity tests according to IEC/EN 61000-4-3) the respective requirements can be fulfilled already with a pyramid length of 75 cm. For measurements in the range >1 GHz, even sizes of 200 to 300 mm are sufficient. Compared to ferrite absorbers, the pyramid absorbers offer the considerable advantage of lower price (depending on size), lower weight and their practically unlimited use up to the high GHz range. The FrankoSorb ® RF absorbers are constructed in the so-called “thin film” technology which totally replaces the carbon filled foam absorber technology. The mechanical realization of the absorber shape is independent from the absorbing function, realized by the resistance film. The shape of the absorber can be made of a lightweight non-combustible, weatherproof and otherwise suitable material. In comparison, the absorber film is very thin. Typically it has a thickness of 10 μm. Consequently, all the advantages of the “shape material” also holds for the complete absorber. · The absorbing foil is situated on the surface of the absorber and mounted directly on the shape material. Consequently, it can transfer absorbed energy very effectively to its surrounding and the absorber is capable of resisting very high field strength. · Transportation volume is low because the hollow construction allows stacking. · All the material in the thin-film technology absorber is non-toxic and noncombustible according to DIN 4102 class A2. · FrankoSorb ® pyramid absorbers (fire class A2 and B2) fulfill the requirements for clean room compatibility according to ISO 14644-1, class 5. Hybrid Absorbers are a combination of ferrite absorbers with impedance matched pyramid absorbers installed in front of them. Hybrid absorbers are a good solution for smaller rooms (e.g. 3 m test range) with restricted external dimensions and frequency ranges from 30 MHz up to approx. 20 GHz.